In 1985, when Super Mario Bros was all the rage, the very first enemy that approached Mario was Goomba. To this date, the fate of a Goomba has been to be stomped on again and again, for eternity. The Goomba that Cecile Fritzvold crafted is an evolution over the years, where a set of reverse fangs were introduced to give it a more menacing look for a baddie in the game. 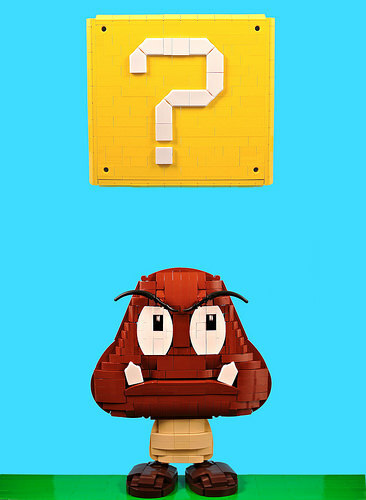 No game is complete without the Question Block, which only leaves me wondering, I’ve yet to see a decent Mario built with bricks in a long while… anyone up for the challenge?